You live in an apartment and want to garden. 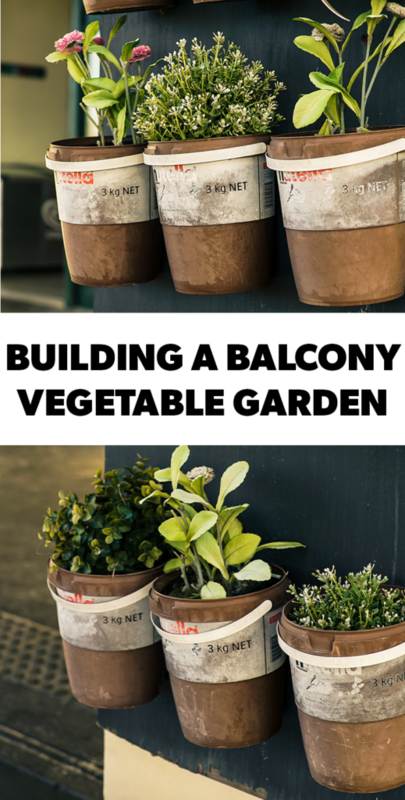 Likely your only option is to build a balcony vegetable garden. Gardening in the confines of an apartment balcony has some significant differences from gardening in a space where you have a yard. In this article I will cover all the major points of gardening on an apartment balcony. Property Rules: The very first consideration is if your landlord or HOA rules will allow a patio garden. Some apartments are very lenient with what tenants can and can’t do, others are very strict. The last thing you want to do is go through the effort and expense to set up a beautiful garden, only to have the property manager come knocking at your door, demanding you remove it. What is Below You: The next consideration in having a balcony garden is what is underneath you. The concern here is if you are working with dirt and water, gravity will do its thing and it will go down. If you have a solid floor on your balcony and water runs off into a gutter, you are pretty safe. If instead, you have a deck where things can fall down onto balconies below, you need to be aware of that. You wouldn’t like the person above you getting your balcony wet and dirty and neither will the people below you. Wind: The amount of wind your garden will get is also something to consider. Containers can dry out quite quickly in a breeze. If you have hanging containers, there is also the wind will be knocking those around. Weight: Another serious consideration is the weight of your garden. Most modern apartments have sturdily built balconies/decks, but some older ones have less robust wood frame decks that might be unsafe if loaded down with big containers of wet dirt. Light: Lastly, when considering a balcony garden, you have to be realistic about how much sun your balcony does, or more often, doesn’t get. For example, if you want to grow tomatoes on your patio, but your balcony faces north, you are not going to have much success. We will talk more about what plants are best for patio gardens in a bit. The first consideration in designing a balcony garden is how much space you want to give up. Most balconies are relatively small, on the order of 5′ by 10′. Obviously, this limits what you can do. If your deck has solid railings you will need to either raise your beds up high enough that they get sun or get planters that will sit securely on top of the railing. I mention securely because you really don’t want to drop a ~50# planter on someone down below. Going vertical can sometimes also be an option if you have sufficient sunlight, and can find a way to go up without violating your rental agreement or HOA rules. If you can put containers on your balcony and the plants still get sunlight, you may also want to consider your comfort working down low. Personally I’m a fan of raised beds and containers. Additionally, if you use raised planters, you will likely be able to control runoff better, which is a definite consideration if you have neighbors down below that you don’t want to drip on. 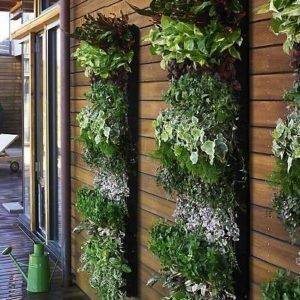 With the constraints that come with gardening on a balcony, what you are likely to be able to grow will be more limited than if you were working in the dirt or raised beds. My first choice for balcony gardening is a variety of herbs. Fresh herbs are probably the most useful thing you can grow in a small space. In just a few containers, you can grow Oregano, Basil, Thyme and so on. I can’t possibly start to describe the difference between fresh and store bought herbs. They also do exceptionally well in containers, and many do well in partly shady conditions. Tomatoes are a favorite for balcony container gardens. They of course require a good deal of sun, but if you have the room and light, these are high yield plant for small spaces. Radishes and shallow rooted carrots like Parisian varieties also are exceptional for containers and I’ve done very well with them in containers on top of railings. Lettuces and spinach are also good balcony gardening choices. Most do well when the get light, but not hard afternoon sun. If you have a wall that gets sun and you can put a trellis against, climbing plants like peas/beans are also a good choice. 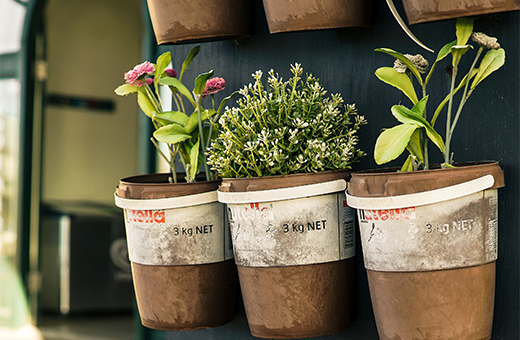 Beyond the actual containers you need, there are a few tools that you will find useful for gardening on your balcony. While some of these overlap with general gardening tools, you obviously won’t need large tools if you are just container gardening. The first thing you should have is a 3 in 1 soil meter. This is essential for making sure that you plants are getting enough water. The other functions of pH meter and light meter can also be useful, but the moisture meter is the main use for it. Something you will find really helpful is a collapsible bin. When it comes time to mix up soil for your containers, you will need something to do it in. You will need more than a 5 gallon bucket and you obviously won’t have room for a wheelbarrow. A 33 gallon bin is big enough to mix up soil in but it won’t take up a lot of room. The other thing you will need is a good quality hand trowel. This will be your go-to tool for mixing soil, potting plants and so on. 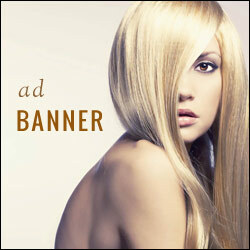 My suggestion is to buy a good quality one that will last you for a long time. Lastly is something to water your plants with, which usually means a watering can. These come in all shapes and sizes, but the considerations for you is to pick one that you can fill in your apartment or condo, and carry out to your plants. Something around the one and two-gallon sizes are probably going to be a good choice. Just remember that if you have hanging baskets that you need to be able to lift it up high enough to water them. While you can’t work with as many plants or have as big of yield with a balcony vegetable garden as you would with a raised bed or traditional garden, but it still can be very rewarding. Gardening is such small spaces requires a little more planning, but still can be very rewarding.